If you’re ever concerned about the safety of using Google Docs as your go-to file storage service for work or personal documents, SafeGDocs might be just what you’re looking for if you’re a Firefox user. Researchers from Gradient (Galician Research and Development Center in Advanced Telecommunications) have been working with Isis Innovation, a part of the University of Oxford in the UK, to develop a free add-on for Firefox that automatically encrypts (and decrypts) your Google Doc files, so you don’t have to worry about any ‘man-in-the-middle’ attacks or anyone accessing your account, at least not for your Docs sake. The system works by first installing the Firefox Add-on. When we tested this, despite downloading it in the Firefox browser it downloaded the .xpi, which then had to be installed by double-clicking and selecting to use Firefox to open the file. Once that process had been navigated, you simply need to authorize SafeGDocs access to your Google account and away you go. I should note that as part of the sign up process you must enter a valid personal Gmail address, Google Apps accounts are not supported. Then, every time you want to save a GDoc more securely you simply click the little combined disk and padlock icon in the navigation bar and select the type of encryption you’d like (or you can select none if you’re feeling a little devil-may-care about it all). The free version allows you to save and encrypt just five documents, and only gives you the choice of one encryption type (128-bit AES) whereas the paid-for option gives you access to all the different types of encryption and algorithms. However, there is no premium version to download just yet, so clicking on that button simply results in a “coming soon” message. Galician said that once encrypted, files are then compressed to save on overhead when transferring it to Google’s cloud. Once encrypted and stored in your Google Drive, the document is inaccessible unless you try and open it from a Firefox browser with the SafeGDocs extension installed, and even then you obviously need the master password (used to encrypt and decrypt all files) to be able to open it. So, even if someone gained access to your Google account, if your master password was different, they still wouldn’t be able to access any of your documents stored in your Google Drive. Requiring the extension to be installed (and the password) to open files is obviously one of the factors that helps SafeGDocs do its job, but it could also cut down on some of the benefits of using cloud storage in the first place i.e. access anywhere from any device with a Web browser. That said, most people would probably not need to encrypt every document stored in their Drive, so it could just be used for important documents with sensitive information that you might not want to open on a public or friend’s computer anyway. The folks from Isis Innovation did say work was in progress for taking it to other browsers, most probably with Chrome next on the agenda based on feedback received so far, they said. 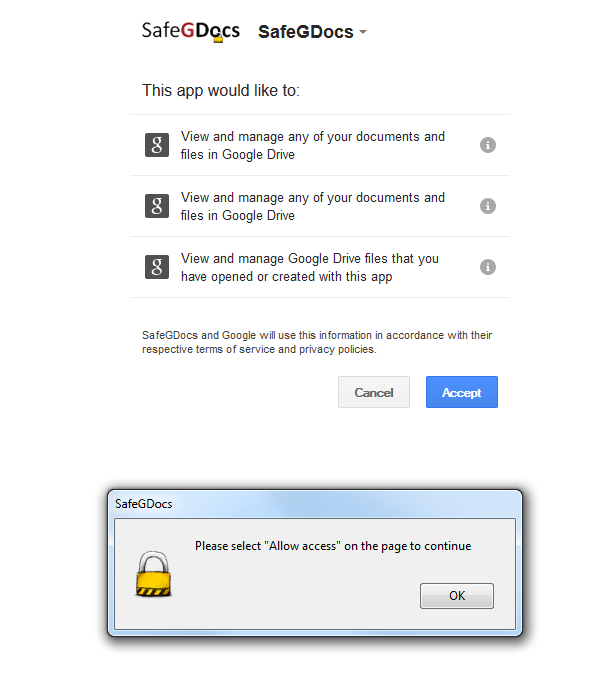 SafeGDocs is available to download now for free for Firefox.